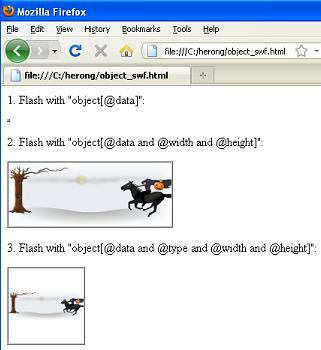 This section provides a tutorial example on how Firefox 26 renders Flash files specified in the 'data' attribute of an 'object' element. Test 1 shows that Firefox 26 is smart to use the file name extension to determine the content type and run the Flash Player Plugin to render the flash file. But the flash file is rendered in a 0px by 0px display area, because no "width" and "height" provided. Test 2 shows that Firefox 26 works correctly with "width" and "height" provided. "type" attribute is optional. Test 3 shows that Firefox 26 recognizes type="application/x-shockwave-flash" as Flash content type. Firefox 26 also resize the display area based on "width" and "height" attributes. When I uploaded object_swf.html to my Apache Web server and open it remotely, Firefox 26 gave me identical result.